After a decent perfomance with the bat, the Lankans were ready to rule the pitch. But as usually Sehwag and Tendulkar started of with their aggression. Tendulkar hit 2 fours in 5rd over. Viru scored a blistering 44 of just 28 balls which helped India to start of well. But unfortunately,attempting an outside off stump delivery of Welegedara, Sehwag hit it to the safe pair of hands of Dilshan. The Master started of really well .Departure of Sehwag did not harm India’s good run. Gambhir also gave a good stand to Tendulkar. But was back to the pavilion after he knocked the ball straight to the bowler S.Randiv for 32 of 52 deliveries. The next batsman in was Yuvraj Singh who started with timing the ball really well. But couldn’t give a proper stand with the Mastero as he was struck by a quick delivery by Welegedara edging it to the Lankan Skipper. On the other hand the Master blaster scored his 73rd ODI fifty and was in a very good touch. India closing to the target of 240 with Dinesh Karthik and The Master on the crease. Tendulkar needed 13 for his ton and India needing 9 for an outstanding victory. The Mastero was just 4 runs short of his next ODI ton but Karthik leaded India to a emphatic win thrashing the Lions and take a cruise lead of 2–1. Will the 3rd ODI between India and Sri lanka be an another high scoring encounter? Will both the Asian countries cross the 300 plus mark yet another time? And the answer to these questions is yes.yes The Cuttack ODI will be a batsman’s day. The Lankan side will have the full advantage to win the game as the Indian side is lacking their skipper Mr.Cool Dhoni as he is facing a ban for 2 ODI’s.But it is in favour of the Lankan side as Dilshan is in very good form as he scored centuries in both the matches which is a big threat to the Men in Blue.The Home side lacking Dhoni and Yuvraj. The Indian bowling attack sounds weaker than the Lions. It will be tough time for the bowlers as there is nothing for bowlers from this pitch.. The Barabati pitch has a fast outfield so if the ball crosses the inside field it will probably be a boundary. Lets hope it is high scoring game from the Indian side.Lets hope the hands of Indian fielders is not filled with butter. Let the catch some and field better. 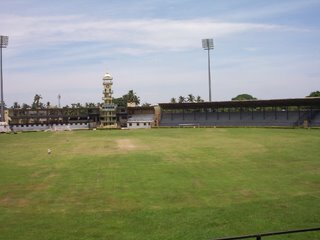 The Barabati Stadium in Cuttack hosted only the third one-day international in this country, in January 1982, when India put it across England by five wickets to lift the series 2–1. In the first Test match here five seasons later, the Sri Lankans were greeted with an underprepared wicket affording vastly unpredictable bounce. Dilip Vengsarkar, then at the most dizzying heights of his career, made his highest Test score of 166, his fourth century in eight Tests, when no other batsman on either side crossed 60. The Lankans were rolled over twice as India seized an innings and 67-run victory. Kapil Dev bagged his 300th Test victim, bowling Rumesh Ratnayake with a ball that failed to sit up. The only other Test match here, against New Zealand in 1995–96, was badly affected by rain, affording less than 180 overs of playing time. Narendra Hirwani, on a comeback trail, took 6 for 59 in New Zealand’s only innings, the best bowling figures here. India have won five out of seven ODI’s at this venue which has also witnessed two games not involving them. Visiting sides have in the past sometimes expressed their qualms about having to travel from Bhubaneshwar, an hour’s drive away, because of the lack of an airport and of quality accomodation in Cuttack.